(You may freely skip this Preface without risk) Let me preface this by saying that I realize a lot of what is to follow will be built upon conjectures and subjective observations. Regardless, I believe there is sufficient truth or at least food for thought that it warrants being written (and read). The primary objective of this article is to promote a critical analysis of old "dusty" games and determine the mindset in which they need to be approched in order to be relevant to modern development. It seeks to identify interesting design decisions that have not been replicated since or served as the origin to a more widespread usage. In better understanding how things have become, or the path not taken, it is easier to identify key elements that could be worth (re) visiting. It is to be noted that, while this article is written in the mindset of establishing a series, it could end up being an orphan. I'd like for this article to stand on its own, but it would greatly benefit from others. Retrogaming, "is the playing or collecting of older personal computer, console, and arcade video games." Such activity has gained in popularity over the last decade to the point where several modern games are developed leveraging this mindset. It is not uncommon to see a series reboot by going back to their roots, or implement interesting twists that link back to earlier titles. I was at the front seat of one such experiment a few years back, when developing a AAA game with a major publisher. Insodoing, the game ended up showcasing short 2D gameplay segments as a reverence to its own origins. Retrogaming is often taxed with being a phenomenon anchored in the player's sense of nostalgia, arguing that these games have been idolised based on the memories of childhood that come with. While I agree there is truth to that, I believe this would be grossly underestimating the value of older games. It is true that games developed 10-20 years ago were limited in scope by technical limitations that could be unconceivable to the modern observer, but such limitations also forced developers to be more creative. Back then, several of the genres we now know (MOBA, RTS, 4X) simply did not exist. Some visionaries had a rough idea of what gaming experience they wanted to achieve, and it so happened that a game genre would be born from this. The most common misconception I've seen modern players and junior designers exhibit about these precursors is the belief that they were barebone/simple experiences without much depth. From my experience, this could not be anywhere further from the truth, and oftentimes, I have come to realize that having a look at one of these "ancestors" humbles me. 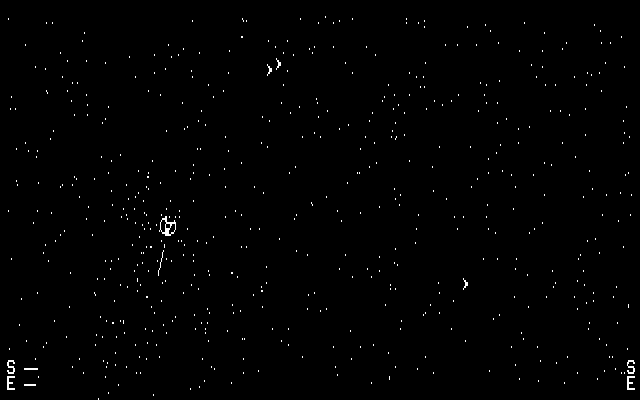 As an example, one of the earliest games, Spacewar! (Released officially in 1962, but in development as early as 1953) was actually a very complex arcade game. For starters, it was a multiplayer real-time game where two ships would fight one another while using their thrusters to prevent collisions, fight against gravity, and attempt to out-maneuver their opponent. It introduced all basic concepts of firing missiles and lasers (projectiles) and damaging the opponent. It had a concept of health points, shield points, and rather complex controls. SpaceWar! (DOS version, circa 1986) But there's more to an analysis of retrogames than merely tossing random facts about Spacewar! There is actionnable knowledge that has been forgotten, especially in decade-long genres that appear to have an existential crisis and are unable to reinvent themselves. Oftentimes, this answer lies in their early installments. Today, I'd like to discuss one of these genres: the "RTS" (Real-Time Strategy Game). There were a number of games that led to the modern appelation of "RTS", but most agree nowadays that the first stepping stone towards the modern RTS was "Dune 2". This begs to question what Dune 1 was really about, but it was actually an adventure game (turns out there's an origin to mismanaging brands earlier than the 21st century!). Dune 2 would be the first title of many during the "conflict" that opposed Westwood Studios (Now defunct, formerly under EA leadership) and Blizzard Entertainment (now part of Activision Blizzard) between 1992 and 1998. In a way, a lot of what RTS games are and are not today was forged by Dune 2, and the war that followed. Since the competition for this market was severe (and the demand quite high), production costs had to be minimized and feature creep restricted. Given the history and ferocious competition for that market share, it is somewhat puzzling that a very popular game such as Starcraft II (2010) would hardly differ from a game made almost 20 years prior. The "RTS War" fell prey to the greater conflict: the war for the best visuals. And for the longest time, we haven't seen much movement on the RTS scene. Some titles have had better execution than others, but most were cast from the same mold. Though RTS is a mainstay of game development nowadays thanks to that "war", a more educated observation is warranted to understand what was earned or lost along the way, and how it can be used today. There's a reason why Dune II coined the RTS genre. It was not only because it presented the core of what an RTS should be, but rather because it provided a complete experience and terrific scope. It was, in many ways, a complex experience that needed to be broken down to understand. It even took a while for Westwood itself to break it down to its essence (C&C) before realizing what they had created in the first place. 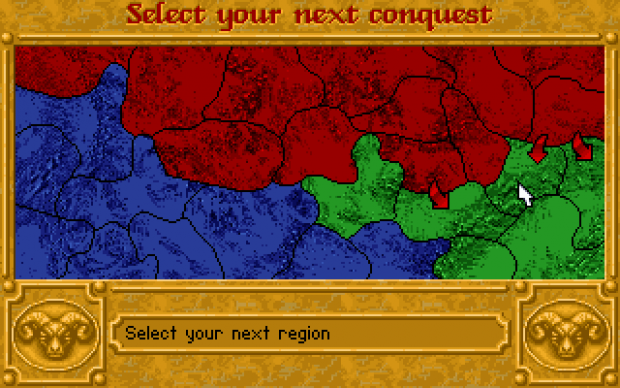 A number of constants were designed during Dune II, but there were also several concepts that were grafted to it. In a way, it was much more than a MVP, and for the most part, it worked brilliantly. Resource Gathering Dune II established the core of the RTS genre by laying resources on the ground and asking the player to harvest them to fuel military unit production. While this mechanic feels natural to the genre, in the case of Dune II, it is actually there out of necessity: the Dune brand (novels, series and movie) is based around the concept of harvesting spice. Unlike most RTS games, harvesting this precious spice is the primary focus, much moreso than actual combat. Armed conflict is only a byproduct of that race for the spice melange. While most RTS titles have inherited this mechanic, they've all done a relatively poor job at putting this mechanic in context (including Tiberian Sun that blatantly mimicked Dune in that regard). For example, in Warcraft: Orcs and Humans, the player is taught that he needs to harvest from local resources (wood and gold) to erect their outpost. For the first outpost, it makes a lot of sense as this is a new settlement, but as the conflict proceeds, the player ends up building various outposts. While it is fairly understandable that it is more efficient to use lumbers where they are available (than say, bring them from another outpost a few leagues away), it is a bit puzzling that the player can't bring along currency and is never explained. 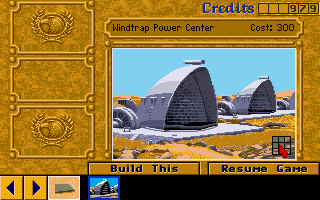 While in Dune 2, all spice is sent back to the motherland in-between mission, and a new colony/mining site is erected during each mission, this feels artificial in any other context. Several offenders have simply imported the gameplay "as is" because it was proven to work, but never managed to make it stick with the theme (Command and Conquer, Warcraft, Starcraft, Age of Empires, Empire Earth, and the list goes on). This is where Dune II excels. Not only has it created an interesting resource acquisition mechanic, but it has actually made it a core part of the game. In Dune II, resource acquisition IS part of the MVP and is not a design mechanic that supports it, and this is a big deal. Harvesting precious spice... As an example, one of the early missions is to simply gather up resources. The player has to realize that creating military units only delays his ability to reach this objective. 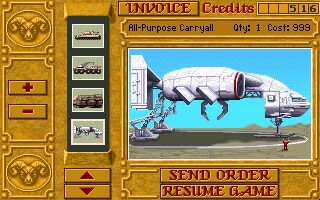 While many other RTS games have used this as an introductory mission, Dune II comes on top here because the game has made it clear from the very first cutscene that this was to be the primary objective. Only much later in the campaign does this turn into a more global conflict, and the player is told that, in order to secure the resource, it will not suffice to try and harvest it faster, but that elimination of other houses is necessary. Thus, the war is explained as an economic decision. The legacy of this resource system can be found in various games (namely the C&C series). It has evolved in most cases however, as we'll be able to cover in a future article. 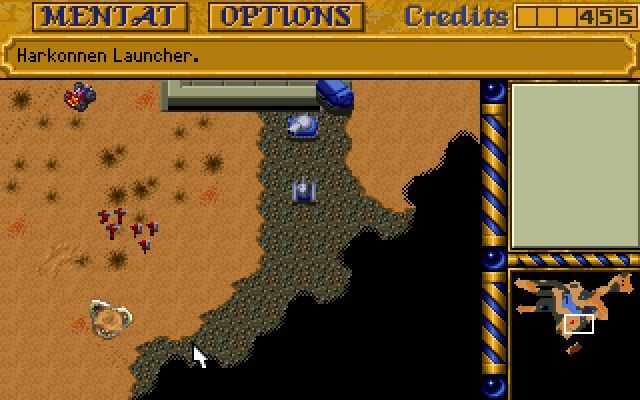 Here, Dune II has only the merit of creating the vanilla concept, as a theme-centric necessity. Energy System Another mechanic that became a staple of the genre (C&C and its derivatives mainly) is the concept of energy. Unlike the concept of "food" which we'll discuss with our next game, the energy mechanic was used as early as Dune II to limit rapid base building, introduce a concept of logistics, and provide strategic weaknesses. The much-required Windtrap! The Windtrap can be perceived as just "another building to build", but it achieves a lot more than that. It requires resources to build, which in turn reduces the player's ability to construct buildings quickly. This form of investment may lead the player to end up investing in units instead of buildings as a result. Furthermore, it gives a sense that the base is not self-sufficient "as is" and gives the player something to keep watch over. They need to determine for themselves whether they want redundancy or can live with the risk of being short on energy (and the consequences of that can be quite drastic). More importantly yet, it introduces the concept of base weakness. The enemy AI in this game is not great, but it understands that power is key. As a result, if a Windtrap is located on the edge of a base, and relatively undefended, they will risk a dedicated attack on it just to cripple the player economically. At this point, losing a few units is deemed an acceptable loss given the economic damage involved. Since Windtraps' energy generation scales with the building's health, they don't need to destroy it completely, just damage it enough to put the base below its requirement level. Though the player can end up repairing the damage for a fraction of the cost, it's often enough to compensate for losing units (cost of repairs + time spent under power level). C&C carried this system along for a bit, and quite a few RTS have revisited it without much improvement to this day. While this implementation wasn't the most "fun and engaging" mechanic, it showed the potential of having to manage base logistics. Mercenaries This is where Dune II starts to differ from most of the titles that followed. While the game had a straightforward unit acquisition system (all units have their own individual cost and time to train), it also boasted a "stock-market" mercenary system to supplement it where unit availability and price would vary, and ETA to delivery (shipping) would be a constant. It allowed players to pay a variable amount of spice (depending on global demand) to field quick reinforcements in numbers. Because the ETA was fixed for all units (marginally lower than actually training units) and that it allowed to field more than one unit in the same delivery, it would be possible for a player to field 4-5 tanks in the time they'd normally produce only 1. The big downside was not knowing how much it would cost them ahead of time, though in "very heated" combat, one may resort to paying a hefty amount for Quads or Trikes (some of the weakest units). This system was a great tactical addition as it provided players with resources to spare with a means to quickly replenish their armies without having to build very complex infrastructures. It did introduce however a bit of unknown (risk) without it being random (based on player demand). Prices would shift, unit availability would differ, etc. Even more importantly, these mercenaries were unique in that they allowed every player access to some faction-restricted units on occasion, which gave them a unique reason to exist. About to buy a Carryall... As the time to delivery was fixed, it also allowed to hasten production of "high tech" units or economic ones. Building a harvester, for example, was a long and tedious task that would prevent building tanks. If harvesters were available from the Starport however, they would quickly be shipped and free your production centers for more military units. In addition, players could save up on "upgrades" by creating defaut units from their production centers, and supplementing their forces through these mercenaries (missile tanks for example, which were generally required in fewer numbers). Furthermore, the player could build units from the Starport only to ensure that their enemy would not have access to those. For example, if several siege tanks were being sold, the player could choose to buy all of them to deny their opponent a chance to reinforce quickly, and ensure that their ongoing attack would not be met with surprise resistance. This is a mechanic that has scarcely come into usage, but ended up appearing as a prominent feature in some RTS games much later. In Ground Control, for example, the only means to acquire units is to send out an order to your mothership and await delivery. As a result, all units have a fixed ETA, and unit production is determined only by resources (not actual infrastructure capabilities). While prices do not vary based on demand and remain exclusive to the player, the core principle behind the mecenaries sub-system is still a chief influence of this approach. Landscaping Dune II made extensive use of terrain. Unlike most RTS that would follow, it was critical to understand how terrain affected options: On the one hand, bases could not be built anywhere. They needed to be built upon "rocky" foundations (and ideally, be built upon concrete). This greatly limited the possibilities and allowed the level designers to control base construction. Some levels were harder simply because the player was limited in the amount of space (thus, buildings) they were allowed. The challenge was to make more with less, which was a good means to ensure players understood key concepts of efficient base building. Furthermore, there were different types of sand. Units would react differently to different terrain types. Some units would roll faster on "hard" sand than they would on regular sand, while others were unaffected. It was important to sync your forces when attacking, and misjudging terrain could result in forces reaching the enemy base out-of-line only to die very quickly. The inclusion of higher ground also introduced strategic depth. Since most infantry could be rolled over by most vehicles, they would rarely provide reliable firepower, except that they were the only units that could go on higher ground, and then became immune to instant-kill from tanks. That, coupled with the fact that most infantry would resist big bullets (aside from the anti-personel siege tank) allowed players to put troopers (rocket launchers) on higher ground to guard against tanks and air units, making them a potent addition to any army. It is to be noted that, without higher ground, infantry would've been close to useless. Though the concept of high ground has been used in a variety of RTS games, it was usually mostly employed as a modifier to give advantage to units on the higher ground (better shot accuracy, visibility, or preventing counter-attack). In Starcraft (1), units on the lower ground had a negative accuracy modifier against units on the upper ground, whereas in Starcraft: Wings of Liberty, they simply could not shoot to higher ground unless they had vision to that part of the map (flying unit, or another ground unit in proximity of the target). In the Warhammer 40k franchise, there were terrain modifiers applied to specific chunks of the map that would increase or decrease a unit's survivability to enemy fire (cover). Most RTS have however done a relatively poor job at implementing interesting terrain features or modifiers beyond damaging terrain (C&C Tiberian Sun) or terrain that slows down units (C&C: Red Alert (ore fields)). Asymetry Dune II introduced some faction asymetry. While the bulk of the units were the same, a few "tweaks" were introduced (namely, a faster/weaker version of the trike for the Ordos, a tougher quad for the Harkonnen, stronger infantry for the Harkonnen, etc.) as well as two unique units per faction. The Atreidis were the only house with offensive air support which forced their enemies to drastically re-think their defenses (more rocket turrets and troopers, less tanks). They also had a Sonar tank which did AoE damage which was particularly efficient vs enemy concentration of forces (such as infantry) but could also cause friendly fire. The Ordos had a terrific tank that could confuse enemy troops and temporarily mind-control them. It could also field a stealth unit called the Saboteur to cause critical damage to structures (later re-used as the engineer in the C&C series). The Harkonnen had a devastator tank which was simply a buffed and extremely costly version of the tanks. It also fielded atomic missiles which allowed it to strike without fear of retaliation. Death Hand missile ready! Though the bulk of the forces were the same, these slight asymetries really changed the way one would approach an enemy depending on their house. Playing Ordos vs. Atreidis was nothing like playing Ordos vs. Harkonnen. This was leveraged by later titles, originally only under a cosmetic form, but eventually led to the much acclaimed design of Starcraft 1, where each faction was entirely different. It is but one of the latent concepts brought forward in Dune II that eventually saw the light of day (with resounding success!). Sandworms Possibly the single most significant yet often misunderstood feature of the game is the Sandworm. The Sandworm generally lays dormant on the map until it is discovered by either player. It is a random force of nature that will hunt down whatever it considers food. Generally, it tends to eat whatever is the biggest, strongest yet nearest unit it can see. Oftentimes, this is a harvester (Economic unit) or a big big tank. Sandworm hard at work. While it could be perceived as random (its AI actually has some randomness involved), it is actually a balancing tool. Despite the fact it was mainly added to support the theme and that it is an important aspect of the lore, it actually plays two important roles from a gameplay standpoint: 1 - Balancing: While the AI is random, the trigger is not. Whichever player discovers it first triggers it. The most likely player to discover it is - generally - the one that's doing "better" (economically). There are two main ways this worm will get discovered: - either a player mounts an offensive and stumbles across the worm by accident or - a player is looking for resources beyond the ones that were available close to their base. In both cases, this means this player is doing well: being on the offensive, or looking for more resources means you're doing better than your opponent, otherwise you'd be dealing with their attack, or they'd have already secured this new resource location and met with the Worm. Since the player that's doing better is more likely to end up losing the first unit, it can lead to a dominant player losing its momentum, putting both players back in a situation where everything is possible: it keeps it interesting. 2 - Threat: It gives a sense of threat. The environment is dangerous, and you can't just scatter units around to get a better view and coverage. You want to pack tight defenses and mobilize your forces only on solid ground. When you do find a worm, you want your formations out of harm's way, and you'll want to protect your harvesters and keep a close watch on them. If you're crafty, you might even attempt to lure the worm to your enemy's base (I sure did!). The Sandworm is much more than a random NPC. While the core concept was somewhat recycled in Warcraft 3, it was mostly used as a means to slow progression and level up your heroes. It didn't quite capture the depth of the original sandworm. To this day, I am unaware of any concept that plays the same role the Sandworm did, as a form of neutral adversary that keeps the match closer to an even-force fight to keep the players on their toes. Campaign Map Between missions, the player was prompted with a map where they would need to choose the next theater of operations. It was more than a mere cosmetic gesture, it actually changed a lot. In most cases, the enemy would be the same (given the choice to strike at 3 different Ordos territories for example) but the level design would greatly differ. This allowed for a lot of replayability, and actual decision-making. If you did poorly on a specific map, you could try another and get away with the victory there because it worked better with your mindset. Harkonnen Campaign. It also gave you an impression that there were other military officers working with you. Whenever you completed a mission, your team did not claim 1 but 2 or 3 territories instead, but you could also lose some. It was interesting to see the map progression differ depending on your actions. On a few occasions, in later levels, you were even provided with a key decision: do you want to fight this house or the other? If you felt you had a better chance against atomic warheads than deviators, you could pick the former (House Harkonnen) at your convenience. Although ultimately, you'd end up fighting both opposing houses AND the Emperor. This mechanic took a fair bit of time to resurface, but it was well executed in the campaign system introduced by Dark Crusade (an expansion of the Warhammer 40,000 RTS). It was successfully supplanted in 2006. It may be surprising that it took 14 years to revisit this mechanice and improve it, but it goes to show how much unexploited potential Dune II has generated with this feature alone. Fog of War There is not much to be said of the Fog of War except that it first originated in Dune 2. The concept of hidden information, critical to a good tactical game with high replayability and risk management, was present in this first installment. Exploration had value early in the game. To try and scout the enemy base and get an idea of what would be coming your way was a big part of every good player's plan. Fog of War. While exploring the map was critical, the concept of a shroud that regrows when the player does not have "eyes on" a part of the map was not present then. With the advent of multiplayer (which we'll discuss later) the need for shroud that regrows became prominent, and ultimately supplanted the need for a lay of the land. In Starcraft II for example, competitions reached a climax where all players were familiar with all ladder maps to the point where the original Fog of War was merely a nuisance to inexperienced players alone. One could argue that the Shroud (that regrows) surpassed the Fog of War in almost every regards, but its concept was only brought forth as a response to Dune II's implementation of the concept of hidden information. #t=227">this interview recently, which is rather relevant!